At sea (longer than expected)! We had a lovely day at sea yesterday. 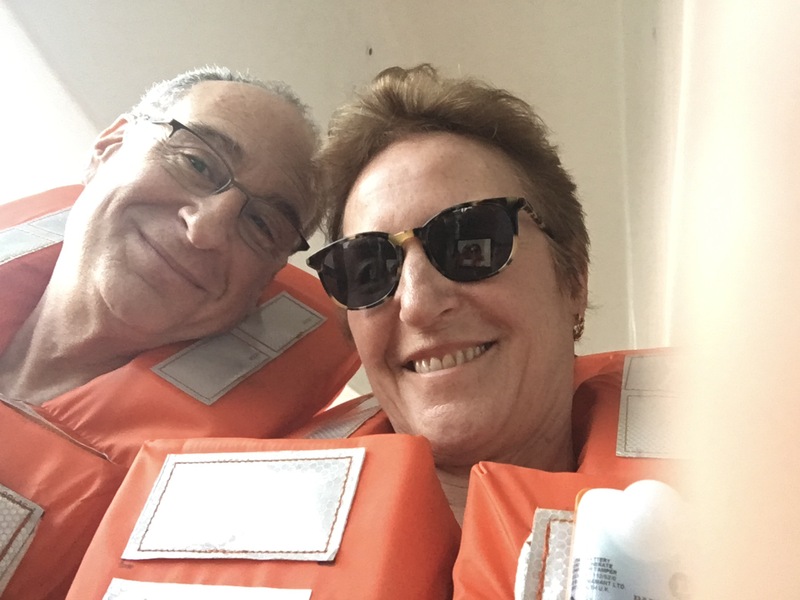 Of course before we sailed we had the obligatory lifeboat drill. I think we could do it all from memory by now, but do it we must and hope we never need it. 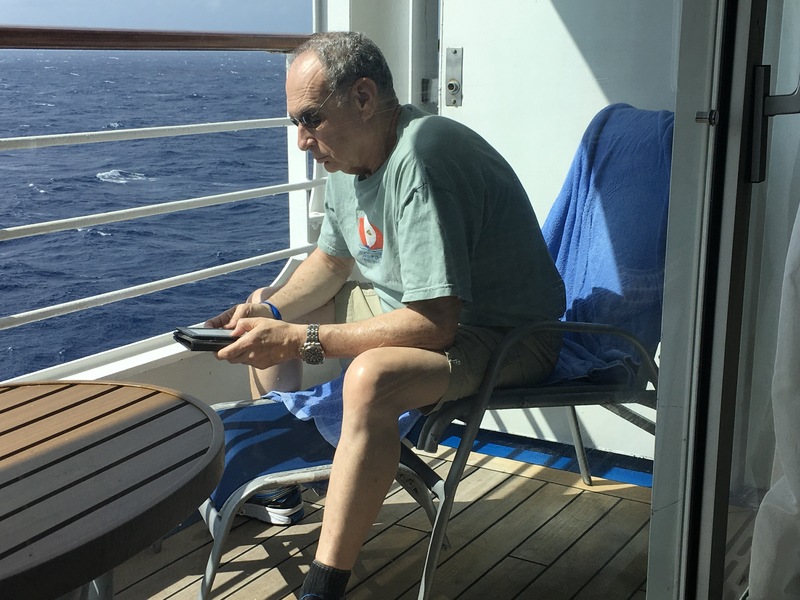 So first day at sea, what did we do? Relax and read, art lesson for me after an hour hoofing it on the deck. We both went to the first of three lectures on the Panama Canal by Daniel Ostler, this was about the French and their failed effort to build the canal. Norm went to the photography lecture. I am thinking of taking part in the quilt project headed by Anna Smith. 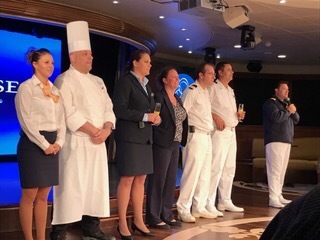 On the last world cruise ( the one after our last one), the passengers made a quilt which was then raffled off at the end and raised $4500 for the crew benevolent fund. They made a book about it, and although I have never done quilting, it looks like a fun and worthwhile project, so stay tuned. 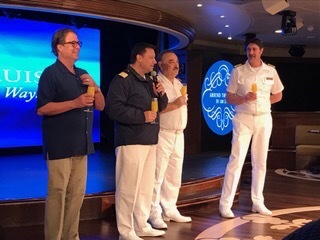 There was also a mimosa party for the Around the World passengers – there are about 160 of us on the ship. We heard from the Captain and a lot of his staff. We already got many gifts, jackets, hats, bags, etc. They treat us very well. The captain’s welcome cocktail party was also last night and we were in some bad weather, so at the party we were told by the captain that it might last a day or two. Never felt it much in the ship but they closed off the outside decks due to high winds. Evening entertainment was by the ‘Cat’s Pajamas’, an acapella group of 4 men – who did an excellent show. So for today, we were scheduled to be in Grand Cayman. We have been there several times and I had my new gopro camera ready. Every time we have gone there I wanted to swim with the sting rays, and it was always sold out. So this time our tickets were ready, and I was very excited about the experience and hoping to film it for the blog. Sadly, about 8:30 AM the captain advised us that the Grand Cayman port was closed due to the weather and we would not be going there but are headed straight for Colombia, scheduled to arrive on Tuesday. So no sting rays this time either. I am writing this at 1 PM and although the seas are still a bit rough, the sun has come out and it is beautiful. Norm and I both enjoy the balcony! So, today we attended the second Panama Canal lecture – this one about the American project, I did an art class where I am working on a pictogram and we will both go to Sunday afternoon at the movies – Hacksaw Ridge. 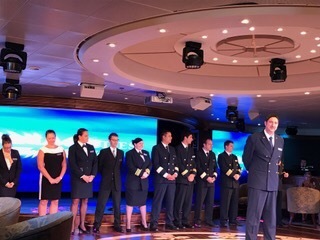 We have met so many passengers and crew that we know for our previous trip – feels like home already. Another sea day tomorrow and then on to Colombia, a place we have never visited. This entry was posted in At Sea. Bookmark the permalink. 6 Responses to At sea (longer than expected)! sorry about the sting rays,,just another good excuse to go back again…. I found David McCulloughs book about building the Canal to be fascinating, I’m sure the lectures were equally so. Ten years ago our daughter, Molly, spent her honeymoon in Cartegena, they loved it. OMG the pics and stories were awesome. Said she wished we could go there together sometime!!!! Drugs will be offered on the street according to their account. Bon voyage! I’ll be reading the blog voraciously. Enjoy! Enjoying this one with you vicariously.